Transformers Legends Is Now On iOS. Here's How to Play It. The Android release of Transformers Legends went a long way towards helping me accept the mobile collectible card game genre, easing me into the experience with familiar characters and themes. Now the free game is out on the iPad and iPhone, giving the Apple side of mobile gaming a chance to collect and battle iconic figures from the franchise's lengthy history. Need help getting started? I thought you might, so I set about creating a beginner's guide to Transformers Legends, perfect for Transformers fans lured to the genre by sweet robot art. I researched the game, spending hours discovering the ins and outs of building my personal army of transforming robots. I made flowcharts. I almost opened PowerPoint. Then ngmoco sent along their own guide, so I threw out all of my work and just used theirs. I find it best to approach the game from a collector's point-of-view. I am not battling other players for superiority. I am collecting Transformers in a way that doesn't lead to a giant pile of toys sitting behind me as I try to find empty spots on the 11 shelves in my office already filled with them. Without further ado, ngmoco tells us how to play Transformers Legends. Transformers Legends is about collecting Transformers cards and build the ultimate card deck. Use the cards of your favorite Transformers characters to battle against bosses and other players. There are several ways to get cards. Space Bridges are an excellent way to get new cards. Open Space Bridges using medals, ally points and battle points or premium currency. Also remember to return regularly to open your free daily Space Bridge. Allies are a good way to get more cards. Cheer your Allies on a daily basis to earn Ally Points. For every Ally you cheer you earn 10 points. For every 100 points you can get a new card from this Space Bridge. Player vs Player battles reward you with Battle Points, which can be used to open the Weapons Space Bridge. Use your strongest cards and defeat other players to score Battle Points. Leveling up is also a good way to earn more cards. When you level up as a player you earn bronze Space Bridge medals and you increase your Ally capacity as well. Leveling up also increases your maximum of Energon; the more Energon you have the more Missions you can play. Missions must be played to find new cards and earn credits. Embark on Autobot and Decepticon campaigns to explore different Battlefields and complete its missions. Be tenacious in your exploration as these missions hold rare cards to be found. At the end of every Battlefield there is a boss battle. Defeat this boss and capture his unique weapon! Episodes are only available during a limited time, but they hold very unique cards as rewards. Participate in Episodes to obtain unique Transformers cards that can otherwise never be obtained from the game. Events are also an excellent way to earn lots of medals for Space Bridges. Upgrade your cards to make them more powerful. Use redundant cards you collect throughout the game to upgrade your favorite cards. The redundant cards are converted into XP, which is used to level up your selected card. With every next level the stats of your card increases. Maxed out cards also receive an extra bonus in battle. Trans-Scan is an excellent way to increase the power of a Transformers character card. Trans-Scan is the process of combining the Alt mode and the Robot mode of a character card. If you upgrade both the Robot Mode and the Alt Mode to Max Level before performing the Trans-Scan, you will get the largest stat increase – a 10% bonus per card on all stats! Cards that have been Trans-Scanned also receive a bonus during combat. Weapons are cards that can be equipped by Transformers character cards. Every Transformers character card has a Specialization and Class. By equipping weapons that match these roles the power of the character card gets boosted. But every Transformers character card from rarity 3 and up also has its own unique signature weapon card. Matching the character with its unique own weapon card boosts the stats of character cards significantly, over 150% and more. Obtain the matching weapon card that belongs to your strongest character cards to unlock the full potential of your deck. Some weapons also have special abilities that really put the power in your card’s punch; triple attacks, increased critical strikes or increase card’s attack power by a multitude! Recommend is an easy and quick way to make sure you have the strongest deck possible. When you hit recommend the game selects and equips the most powerful character and weapon cards available. Checking the Deck Power stat is an excellent and easy way to monitor the increase of your deck’s power. Rarity determines the power of a card; the higher the number on the card frame the stronger the card. Try to collect as much high rarity cards as possible to make your deck stronger. Always make sure you not only have the strong Team, but also make sure you put your strongest cards in the Autobot and Decepticon Squads. These squads are used for boss battles and by winning boss battles you can capture it’s weapon. You don’t want to miss out on these opportunities by losing the battle - so always bring your strongest cards with you! Episode events can give you access to some of the most favorite and awesome TRANSFORMERS cards. There are a few tricks that can help you win in events. Faction affinity bonus gives cards from the opposing faction a special bonus during events. Faction affinity is a 3 stage bonus. Every card that’s of an opposing faction than the event’s cards get a 5% bonus to its Attack. If all the 3 leaders in your deck are of same faction all cards in your deck get 10% bonus to Attack. And if all cards in your deck are of the same faction, they all get a 20% bonus to Attack! So during events Using the Recommend button in your party screen automatically selects the best cards during events, and it will automatically take faction bonus into consideration. Episode cards are cards that get an extra x3 or even x5 battle bonus during special Episode events. Getting these cards and fully upgrading them boosts the power of your deck significantly. Get special Episode event cards from Space Bridges, event point rewards and leaderboard ranking rewards. Battle cube and energon management can be key in making your participation in events a success. Some actions within an event reward you with additional items. For example, in the Raid Boss event you get a free Battle Cube for Killing Blow you deal to any Raid Boss. By strategically selecting and quickly killing off other player’s raid bosses you not only a share in the event points that you need for the event rewards, but Battle Cube reward results in that you basically earned points for free! You know what they say about Transformers; they’re more than meets the eye. That’s also certainly true for Transformers Legends. The Cyberdex is a convenient tool to read up on your cards. Check out your character and weapon cards to see what powers lie hidden within them. You might find some unexpected but powerful surprises there! 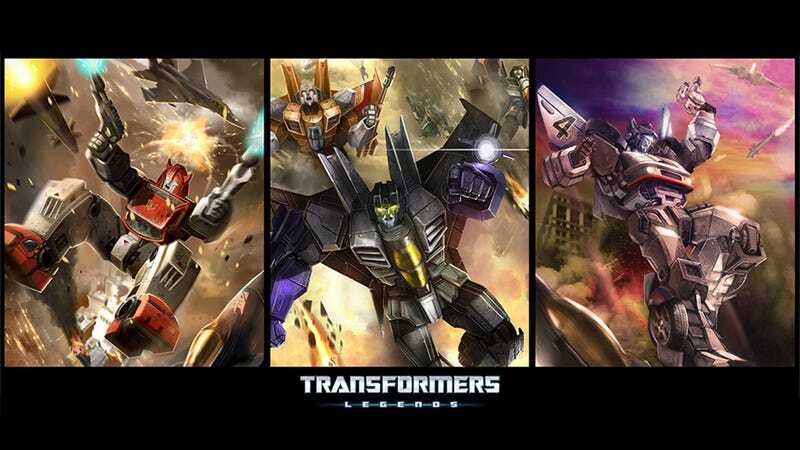 Get Transformers Legends on iTunes here.